UA senior Kaitlin Costello flies high behind freshman Delaney Schnell on the spinning Endeavor during Spring Fling on the mall at the University of Arizona on April 13, 2018 in Tucson, AZ. Carnival rides will once again fill the east end of the University of Arizona Mall for the student-run Spring Fling. It’s Friday through Sunday. Admission is $5. Celebrate folk music and traditions at this free two-day family-friendly boot-kicking event. 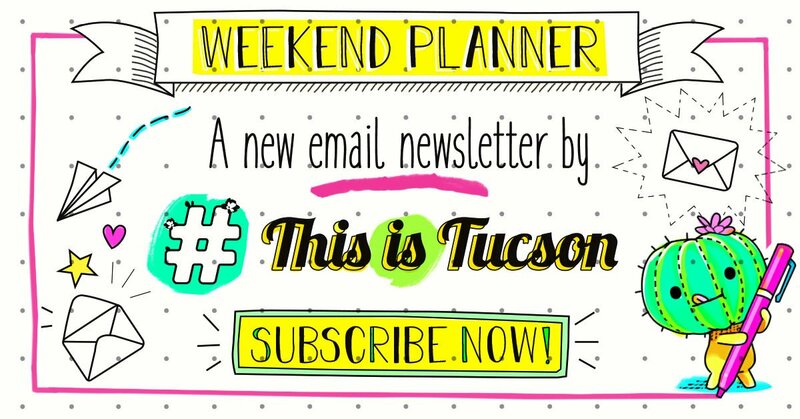 The Tucson Folk Festival takes place in Historic Downtown Tucson with six venues within walking distance of Jácome Plaza (corner of Stone and Pennington). The festival includes 120 musical acts, beer gardens, an instrument petting zoo, kids activities, songwriting competition finals and free music workshops. Ballet Rincon and the Tucson Museum of Art and Historic Block's Education Department are teaming up to present Art in the Park. Enjoy a afternoon of youth-based performance art and art making. There will also be family activities, interactive demos and food trucks. Tucson Parks and Recreation is hiring now for KIDCO recreation workers, lifeguards, therapeutic recreation worker — must be at least 16 to apply. Join Johnjay and Rich from 93.7 KRQ for #LovePup Family Fest at Reid Park. Live music will be performed by Logan Henderson, Madison Beer and The Rich Berra Band. The pup-tastic event will also have activities for the kids, pet adoptions and more. Where: Gene C. Reid Park, E. 22nd St. When: Friday, April 5, 5-9 p.m.
Join the walk with friends and family to support the Autism Society of Southern Arizona. After your walk, visit the resource and activity portion of the event to get some information and enjoy activities. When: Saturday, April 6, 7:30 a.m.
Help Therapeutic Ranch for Animals and Kids celebrate its 12th year of connecting animals to people. Check out the musical entertainment, auctions and watch the TRAK Drill Team will perform a sunset show. When: Saturday, April 6, 5-9 p.m.
Shop a two-day event for handmade, artisan crafts, vintage clothing/collectibles, artwork and more. Food is available for purchase. When: Saturday, April 6, 10 a.m. to 6 p.m. and Sunday, April 7, 10 a.m. to 4 p.m. Cost: Free to attend, but bring some money for shopping. Crawfish Boil at Sentinel Peak Brewing Co.
Sentinel Peak is hosting a zesty shell-cracking event. Eat some cajun style grub, crawfish and drink some tasty brews. When: Sunday, April 7, 11 a.m. to 10 p.m. Cost: Call 520-777-9456 for details. Crawfish Boil at the Brewing Co.
Get ready to laugh, be silly, and show off your talents in this interactive family musical. The ringmaster of this kooky circus has gone missing. Join the audience and help solve the mystery. Where: Live Theatre Workshop, 5317 E. Speedway Blvd. Cost: $10 adults, $7 for kids. Check out Spring Fling, in its 45th year — the largest student-run carnival in the nation, and experience more than 35 rides, games and more than 20 original food booths. When: April 12-14: Friday, 4-1 p.m.; Saturday, 11 a.m. to 11 p.m.; Sunday 11 a.m. to 6 p.m. Looking for a used bike or part? Join the largest bicycle swap in Tucson. Over 40 vendors will be selling, buying or trading bikes/parts and clothing along Fifth Avenue near Fourth Avenue. When: Sunday, April 14, 7 a.m. to 1 p.m.
Ride your bikes and tricycles to the zoo before noon and get free admission. The zoo will have themed activities, like anteater conservation, climate change activity, plant raffle and animal presentations/encounters. Cost: Free, remember ride and park your bike inside the zoo before noon. It's that time again! Enjoy funky fair food, see some concerts, visit the carnival rides, booths and animals. TLC will be performing this year. Where: Pima County Fairgrounds, 11300 S. Houghton Rd. Shop local vendors selling jewelry, art, clothes, pottery and other goodies. Where: 1 E. Toole Ave. When: Saturday, April 27, 10 a.m. to 5 p.m. Cost: Event is free to attend, but you can purchase tickets to get access to the market early. Enjoy a wide variety of science-based activities with your kids at the Zoo. Activities include non-newtonian fluids, oobleck making, static electricity, numbers game, robotics, miniature world of animals, self-watering plant, life sciences and radiology and more. Cost: This event is free with regular Zoo admission. Sample beers from Arizona's best breweries and other tasty goodies. The festival features live music, yard games, tastings, one commemorative tasting mug and a state-wide IPA competition. Where: Armory Park, 222 S. Fifth Ave. Cost: $40-$70, $10 admission for designated drivers. Food is available for purchase. This is a adult art show featuring erotica themed artwork by Tucson artists. You will get to see live body painting, DJ's, live band, music, dance and burlesque performances, food for purchase. Where: The Sculpture Resource Center, 640 N. Stone Ave. When: Saturday, April 6, 7-11 p.m. Cost: Free, donations accepted. Adults-only event. Put on your walking shoes on for a meet up at Maynards. Walkers will get to enjoy 25 bands and performers as they walk the 2-mile route. As you make your way back, walk to Hotel Congress for the main stage performance and raffle prizes. If you get hungry, some tasty barbecue will be available for purchase. Life throws curveballs at everyone. But what makes us unique is how we react to those setbacks. From learning to love again to learning to ride again, join us as we share stories about our greatest comebacks. When: Tuesday, April 23, 6:30-8 p.m. Hop down the rabbit hole to Sahuarita for egg hunts, activities, food trucks, and pictures with the Easter Bunny. Little hunters need to keep their eyes open, because there will be twenty-five silver eggs hidden in the hunt too.